After many years of experimenting with my hives, I have finally came up with what I think is a good design. It incorporates all of Warre's natural bee-keeping aspects with just a few improvements. The center 4 top bars are removable frames but no bottom rail, this should satisfy any inspector if one should ever come. Pest control measures are using a screened bottom board with a tray underneath which catches 100% of the dropped pests. A Beetle-Jail entrance and a Cedar filled blanketed roof for ventilation. 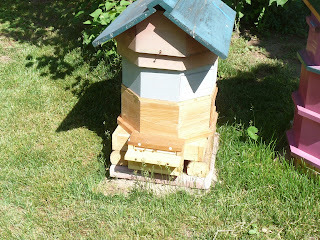 This picture shows it with a top feeder box installed. NYS had a 57% bee loss this year, I had none. Last night I closed off the entrance to my swarm trap in preparation of moving it to a new hive. This morning early I set everything up and then lowered the trap down and moved it close to the new hive where I pulled the top and found many bees, probably a small cast from my feral hive as they look Italian. Anyway, the transfer went well and now the bees are buzzing around the entrance. A few stragglers are hovering where the trap was but I suspect they will find their new home soon, then I can put the trap back up. I have expanded my hives from 3 this spring to 7, with 1 die-out from unknown causes. 1 hive is still suspect as to whether or not it has a queen. Am going to check soon for brood cells. I have given away 2 swarms also and lost 2 from not being here. Good year so far. I harvested 2 combs of extremely dark honey on Weds. this week. I'll market it as high potent allergy med., have 1 buyer coming today. The hive that was over-ridden with beetles is back to normal with no signs of them for 2 days now. The tray is magnificent having removed about 1,000 or more larvae daily for over a week, along with the mature beetles. Koodoos for the bees as they have done well.